Join the discussion on our forums! 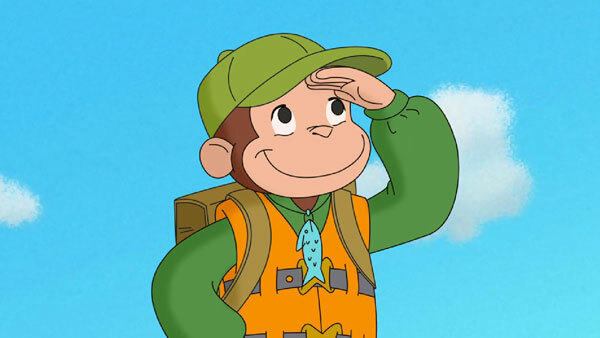 Come discuss Bright-Eyed Scout over in our dedicated Bright-Eyed Scout discussion topic. LOOK, LOOK!!! A 5-MANA INNERVATE!!! When I draw card by Bright-Eyed Scout and its a Secret, it costs 5 mana even I have Cloaked Huntress on the board. After I played second Cloaked Huntress it cost change to 0. It depends on the order in which you have played your cost-changing cards. If the Scout comes after the Huntress, the secret will cost 5. If the Huntress comes after, it will cost 0. It's not a bug, it's just that they can't both work at the same time, so "timestamp" decides which one should decide the cost. Nice try Blizzard but everyone knows female dwarves don't exist. I think this card is actually very good. Compare it to Gnomish Inventor, which has seen constructed play in its own right, and this is a better body for the same price with "Draw a card" on it. There's the obvious downside of potentially drawing a card that would normally cost less than (5) and inflating its cost, but you're still drawing the card which is a very powerful effect. Now, consider the upside: You play this on turn 4 and you can curve perfectly into whatever it is you draw. If it's another 4 mana card it seems bad but not really as you're not likely playing anything for (1) on turn 5 any way, if it's a (5) mana card you've basically just played a better Inventor, and if it's anything (6) or more you're potentially getting quite a swingy follow-up turn. We have Azure Drake going to Hall of Fame and I see this card to some extent filling a hole it's leaving in that it's a cantrip that has a decent sized body for its curve to fill the middle of the deck, particularly for decks that will have a fairly big high-end range of cards like a control deck. In Priest for example, sure there'll be times you hit you Shadow Word: Pain, but there'll also be times you hit your Ysera or whatever other big threat you're using as a closer, and even in the SW:P context, I'd rather have the extra card and pay (3) extra than draw SW:P on Turn 5 (or whenever). Just because it says curious makes it a reference? 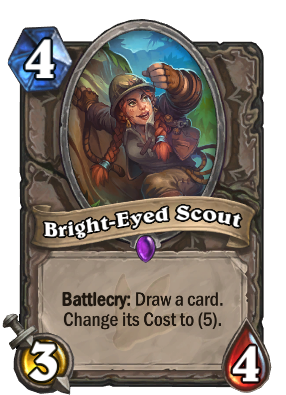 Bright-Eyed Scout ... because making execute cost 2 mana wasn't enough. This card has some real potential. I mean.... No matter what, it draws you a card you can play next turn. Sort of like a Jeweled Scarab but it draws instead of discovering. And that card could be a Molten Giant, a Mountain Giant, or an Arcane Giant, which will all probably be 0-3 mana 8/8s now. This card was designed to make you feel better when playing that lonely ooze vs mage before passing. You will always have something to play on turn 5. It's outcurving for you you won't need to think about playing a 3 and a 2 drop just play the 2 drop that costs 5 now. I cannot wait to draw my Innervate with this card in my ramp druid deck, kappa. You reminded me of my tries with Astral Communion decks, so many PogChamps.